It’s been a very busy Summer of wedding photography for me, and I’m still a little behind on blogging all those weddings and keeping the site up to date with new pictures. So a notification in my email today let me know I’ve won another two awards in this year’s on-going WPJA wedding photography contest. It’s a competition that awards the best in documentary and wedding photojournalism, which is the only style of photography that I use. This image above is from Renée and Dexter’s Summer wedding photography at Addington Palace in Surrey. Check out more of their story on the blog. This is from their first dance in the splendid Great Hall. I’ve taken a low angle position so that we get to see some of the grandeur of the room, especially that wonderful chandelier. I like this kind of shot during the First Dance, as you get to see the wedding guests watching the action. I usually frame the shot, then wait for a reaction or focal point to draw the eye into the image. Here, it’s the obvious kiss that anchors the picture. 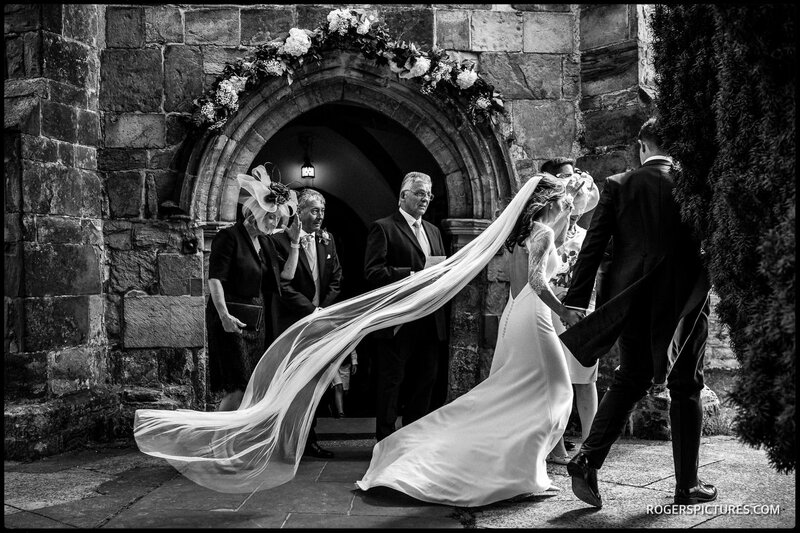 This second winning photograph is from Rebecca and Mark’s Summer wedding in Ticehurst. It was one of those balmy summer days at the end of a long spell of hot weather. It was still a warm day, but the wind was picking up all morning, and I was on the lookout for a way to illustrate this in the photography. As Rebecca and Mark left the church, a guest of wind picked up her veil, and I shot several frames, hoping for a nice shape to the veil. This frame works well for me, with the shape mirroring the dress, and good overall balance across the frame.